Mik didn't plan on getting off in Ketchikan, but when Mom and I got off and discovered the movie theater was not too far I went back and made him get off the ship. He had been wanting to see the new Harry Potter movie and was glad to get a chance to see it in Ketchikan instead of having to wait a week to see it. 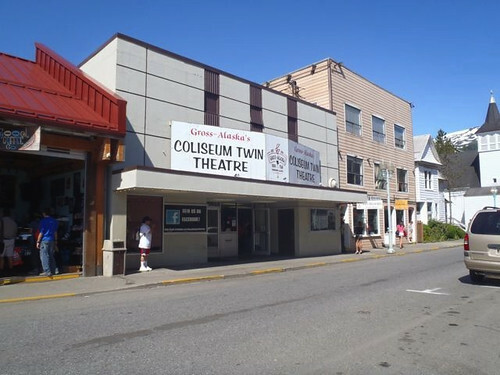 The movie theater in Ketchikan was right in the downtown area within walking distance of the dock. It is a small town theater, but they just got 3D that weekend, so we got to see the new Harry Potter in 3D. It was not a 3D necessary movie, but it was cool to see a 3D movie the first weekend it came to Ketchikan. The theater is the older ramp aisle style. The only spot for a wheelchair, though was in the back off to the side. Thus you get an odd angled view of the screen, since the theater is also wider than typical modern ones. However, it was still good enough to enjoy the movie.